The users who have purchased licensed iGO 8 software for PDAs or CarteBlanche Navigator software for PNDs and car multimedia systems can update the software and maps at the official NNG website. To receive the updates you need to create a user account and install Naviextras Toolbox software, which will help you to check the availability of updates and to download them (Naviextras Toolbox User Guide). 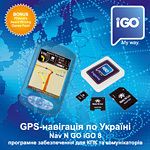 Today, there is a significant number of personal navigation devices with factory preinstalled iGO 8-based software on the Ukrainian market. Please check the availability of map updates for such navigation on NNG official map update portal. To receive the updates you need to create a user account and install Naviextras Toolbox software, which will help you to check the availability of updates and to download them (Naviextras Toolbox User Guide). If no updates are available, the users can change to iGO-based CarteBlanche Navigator software with the newest map of Ukraine. If you can not find your navigation device in the list of compatible devices, please contact our technical support service. iGO My Way 2006 Plus software version is already discontinued, and the software developer no longer provides technical support and map updates for it. 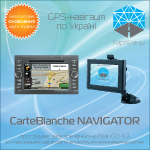 The users of iGO My Way 2006 Plus software, which is incompatible with the new versions of CarteBlanche Ukraine map, may change to iGO 8 or CarteBlanche Navigator software, provided that their navigation device is compatible with the above products.